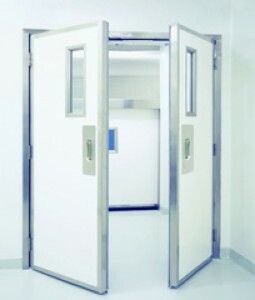 Paired Swinging Seamless Molded Fiberglass Door System | Dock Door Systems Inc.
20 gauge stainless steel edge capping for added protection and durability. Grade 1 Architectural hardware standard:Hager BB1191 standard weight stainless steel fully mortised hinges. Frame mounted, three-sided bulb type perimeter gasket, center astragal, and bottom sweep gasket. Power operation utilizing an electromechanical operator, microprocessor controlled in 120 volt,single phase, with mechanical spring close. Operator completely enclosed within a 16 ga.304 #4 stainless steel sloped shroud. Pushplate to open - time delay to close.In case of power failure, door can be opened manually at any time.